THREE lawmakers asked the Department of Trade and Industry (DTI) yesterday why the prices of basic commodities, especially food items, have remained high despite the significant drop in the prices of petroleum products. 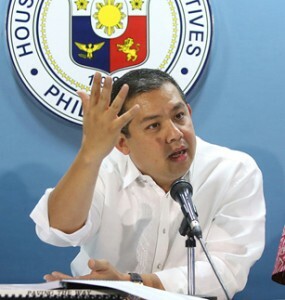 House independent bloc leader and Leyte Rep. Martin Romualdez, Quezon City Rep. Winston “Winnie” Castelo, and Kabataan party-list Rep. Terry Ridon said that the DTI should ensure that prices of basic commodities are just and fair amid the series of rollbacks in the prices of petroleum products. According to the Department of Energy (DoE), gasoline prices have dropped a total of P13 in 2014, while diesel prices have dropped by a total of P15 in the past year. At present, gasoline prices range from P38 to P40, far from the more than P50 per liter cost recorded in recent years. Diesel prices, meanwhile, now only stand between P27 and P29. Yesterday, major oil companies again implemented a P0.95 and P0.80 per liter rollback in gasoline and diesel prices, respectively. Romualdez said that the DTI should run after unscrupulous traders who might be taking advantage of the situation. “The DTI should explain why there is no adjustment in the prices of basic commodities despite the huge drop in the prices of petroleum products. They should apprehend traders who might be profiting from the situation,” said Romualdez, a lawyer and president of the Philippine Constitution Association (Philconsa). “Logic dictates that when there is huge drop in the prices of petroleum products, there should also be a cut in the prices of basic commodities and slash in the fare of public utility vehicles,” Romualdez stressed. Castelo agreed with Romualdez, explaining that prices of basic commodities easily go up when prices of petroleum products increase. “Our concerned government agencies like the DTI should find ways how to reduce the prices of basic commodities following the significant drop of petroleum products’ prices,” said Castelo. “When the cost of fuel in the world market spikes, manufacturers and producers here in the country are quick to adjust their prices. Yet, why is it that when a historical drop in fuel prices is observed, the price of basic commodities remain unchanged?” Ridon added. He then urged President Benigno Aquino III,the National Economic and Development Authority (NEDA) and the DTI to take immediate measures work to bring down the prices of basic commodities. “We’re talking about an issue close to everyone’s heart: food prices. Consumers are waiting. This is not an issue that the government should bungle,” Ridon also said.